By Frank Abrahams and Paul Head. Case Studies in Music Education is about making the journey as a music teacher - about the critical real-world issues music teachers face but rarely seem to get the notice of college or graduate school music courses. How should a music teacher balance learning and performing? What is the best way to handle an angry parent? What are the consequences of the grades teachers assign? What are the best ways to discipline students? How should teachers relate to the administrators? To other teachers? What if the school is breaking the copyright law? These are just a few of the issues covered in this book. The emphasis here is not on the solution, but on the process. 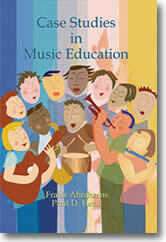 Case Studies in Music Education is a book that will engage you and help you become a more effective music teacher.